We’d love your help. Let us know what’s wrong with this preview of Peak by Anders Ericsson. Mozart wasn’t born with perfect pitch. Anders Ericsson has spent thirty years studying The Special Ones, the geniuses, sports stars and musical prodigies. And his remarkable finding, revealed in Peak, is th Mozart wasn’t born with perfect pitch. Anders Ericsson has spent thirty years studying The Special Ones, the geniuses, sports stars and musical prodigies. And his remarkable finding, revealed in Peak, is that their special abilities are acquired through training. The innate ‘gift’ of talent, is a myth. Exceptional individuals are born with just one unique ability, shared by us all – the ability to develop our brains and bodies through our own efforts. Anders Ericsson’s research was the inspiration for the popular ‘10,000-hour rule’ but, he tells us, this rule is only the beginning of the story. It’s not just the hours that are important but how you use them. We all have the seeds of excellence within us – it’s merely a question of how to make them grow. With a bit of guidance, you’ll be amazed at what the average person can achieve. To ask other readers questions about Peak, please sign up. If you want to get better at anything, this book is your starting point. As a sophomore in high school, I remember asking my favorite English teacher if he would sign off on my application to an advanced writing class. The look on his face was shock: mouth open, eyebrows raised. I felt stupid for even asking. Needless to say, I took a general English class my junior year. But I decided I didn't want the other kids to get ahead of me academically. I didn't have that elusive, all-important trait that If you want to get better at anything, this book is your starting point. But I decided I didn't want the other kids to get ahead of me academically. I didn't have that elusive, all-important trait that everyone calls "talent." I had a brain that was geared more towards science and math, so when I read in Geoff Colvin's Talent is Overrated that there was a science behind improvement, I was blown away. I emailed K. Anders Ericsson, asking for research on how to use deliberate practice to improve my writing skills, and, to my surprise, he actually emailed me back. In this book, he made all of that research even simpler. Soon I began writing and reading every night for about an hour, focusing on improving my weaknesses, imitating my favorite writers, and stepping out of my comfort zone. I took an AP writing course my senior year. I scored a 5 on that test (the highest score possible). I aced a creative writing course in college. I began submitting my fiction to literary magazines (at this point I was churning out at least one story a week). I became a professionally published short story writer at 20 years old ("Elite Slugger" in Cracked Eye). I still have a long way to go, but one day I want to be a New York Times best-selling novelist. Without Mr. Ericsson's research, I would still be a sub-par writer. Instead, I developed a passion for something that no one thought I could do. More importantly, though, I developed a passion for improvement, and that doesn't really depend on some outside factor, like whether or not a publisher wants to buy my work. Improvement is an intrinsic, driving force. Whether or not I ever become a New York Times best-selling novelist isn't the point. The point is constant improvement. The extrinsic goal is a side effect. K. Anders Ericsson writes a good book with lots of practical applications that falls victim to the classic type 2 statistical error (false negative). Let's start with the good stuff. Ericsson tells a lot of cool anecdotes about the utility of deliberate practice. He never really defines deliberate practice. But basically it means getting a coach and performing focused exercises to get better while analyzing results. Easy enough. There is also some cool material about improving mental representat K. Anders Ericsson writes a good book with lots of practical applications that falls victim to the classic type 2 statistical error (false negative). Let's start with the good stuff. Ericsson tells a lot of cool anecdotes about the utility of deliberate practice. He never really defines deliberate practice. But basically it means getting a coach and performing focused exercises to get better while analyzing results. Easy enough. There is also some cool material about improving mental representations. The stories are encouraging, and they widen one's perspective of what is possible. Now for the negative. Well, first, the "what should I do?" portion of the book could have been written in about 5 pages. But that's not the big deal. This is the big deal: "And this, more than anything else, is the lesson that people should take away from all these stories and all this research: There is no reason not to follow your dream. Deliberate practice can open the door to a world of possibilities that you may have been convinced were out of reach. Open that door. " That, my friend, is really destructive nonsense. Because Ericsson falls prey to the type 2 error. His life's research is based on taking really successful people, moderately successful people, and sort of successful people and trying to find what the difference is. There, in music, in chess, in hockey, and in baseball, he finds that a strong correlation between deliberate practice and expertise. But I would bet a lot of money that Dr. Ericsson never played sports at a young age. Because he misses the type 2, the false negative. He doesn't take into consideration the kids who practiced harder, longer, with better coaching than anyone else, and still sucked. That is a common story. Do you remember the kid that had incredible explosive speed but had no coordination? Coaches spend all kinds of time with those kids because of their potential. But after years of deliberate practice with great coaches, some of them just can't catch. They are uncoordinated. In explosive sports, basketball, football, sprints, jumping, boxing, talent is king. Check out this article, for example, Lombardo, Michael P., and Robert O. Deaner. “You Can’t Teach Speed: Sprinters Falsify the Deliberate Practice Model of Expertise.” PeerJ 2 (June 26, 2014). doi:10.7717/peerj.445. In skill-centric sports, hockey, baseball, tennis, skill practice makes a big difference. In any sport, practice is what differentiates the great from the good. It is important, and that's why it is so evident in Ericsson's research. But Ericsson didn't spend his time trying to find all the people that put in years of hard, smart work with great coaches and just never became good. They didn't learn how to sing, or how to catch, or how to run fast or jump high. Genes do not guarantee success, but they are still important. The same is true of public speaking, art, science, math. There's a reason why most theoretical physicists are really smart and it's not because the less smart people just didn't work hard enough. Don't lie to people and tell them to chase whatever dream they have regardless of their situation. That's a recipe for heartbreak. Be honest and tell people to work hard and train smart. Tell people that they can always improve if they are willing to pay the price. That's enough. But it doesn't sell many books. All of these elite players were committed to chess, and in the beginning the ones with higher IQs had a somewhat easier time developing their ability. The others, in an effort to keep up, practiced more, and having developed the habit of practicing more, they actually went on to become better players than the ones with higher IQs, who initially didn’t feel the same pressure to keep up. And here we find our major takeaway message: In the long run it is the ones who practice more who prevail, not the ones who had some initial advantage in intelligence or some other talent. (p.248) -- I don't agree with this quote, but I think that there is a lot of truth in it. I don't think this had to be a whole book but that said I do think the idea behind the book is a meaningful one. I know I personally spend a lot of time practicing things without getting better because I don't actively engage in what I'm doing and try to improve on whatever part of the skill I struggle with most. I also thought the writing was really good and appreciate that it was based on so much research evidence. Definitely was something new that I hadn't really thought of before. Anders Ericsson reasons that expertise is best developed by deliberate practice and the existence of innate talent is an unconfirmed hypothesis. Deliberate practice means doing - knowledge by itself is not indicative of expertise. This is a positive book as its message is that the power to become great in any area is in everyone's hands. Gaining expertise is largely a matter of improving one’s mental processes. If you never push yourself beyond your comfort zone, you will never improve. Purposeful practice has well-defined, specific goals. “Play the piece all the way through at the proper speed without a mistake three times in a row.” Without such a goal, there was no way to judge whether the practice session had been a success. Break it down and make a plan: What exactly do you need to do. Putting a bunch of baby steps together to reach a longer-term goal. You seldom improve much without giving the task your full attention. Purposeful practice involves feedback. You have to know whether you are doing something right and, if not, how you’re going wrong. The main thing that sets experts apart from the rest of us is that their years of practice have changed the neural circuitry in their brains to produce highly specialized mental representations, which in turn make possible the incredible memory, pattern recognition, problem solving, and other sorts of advanced abilities needed to excel in their particular specialties. The relationship between skill and mental representations is a virtuous circle: the more skilled you become, the better your mental representations are, and the better your mental representations are, the more effectively you can practice to hone your skill. Deliberate practice requires a student to constantly try things that are just beyond his or her current abilities. Thus it demands near-maximal effort, which is generally not enjoyable. Once you have identified an expert, identify what this person does differently from others that could explain the superior performance. The traditional approach has been to provide information about the right way to proceed and then mostly rely on the student to apply that knowledge. Deliberate practice, by contrast, focuses solely on performance and how to improve it. How do we improve the relevant skills? Get some personal sessions with a coach who could give advice tailored to your performance. An experienced teacher watching you and providing feedback. Someone who knows the best order in which to learn things. Focus. Feedback. Fix it. Break the skill down into components that you can do repeatedly and analyze effectively, determine your weaknesses, and figure out ways to address them. Shorter training sessions with clearer goals are the best way to develop new skills faster. It is better to train at 100 percent effort for less time than at 70 percent effort for a longer period. Cross-training - switch off between different types of exercise so that you are constantly challenging yourself in different ways. Push yourself well outside of your comfort zone and see what breaks down first. Then design a practice technique aimed at improving that particular weakness. Strengthen the reasons to keep going or weaken the reasons to quit. Talent is made, not born. Specifically, according to Ericsson & Pool, it's made through years and years of deliberate practice: the process of learning to recognize and emulate existing models of elite performance, through active trial-and-error, regular expert feedback, and self-motivated resilience. Deliberate practice is necessarily painful, but rewarding for those who keep at it. Key implications: There's no "genius" gene, and in any case it doesn't take genius to become an expert or eli Talent is made, not born. Specifically, according to Ericsson & Pool, it's made through years and years of deliberate practice: the process of learning to recognize and emulate existing models of elite performance, through active trial-and-error, regular expert feedback, and self-motivated resilience. Deliberate practice is necessarily painful, but rewarding for those who keep at it. Key implications: There's no "genius" gene, and in any case it doesn't take genius to become an expert or elite performer. Most of us are born with the potential to excel in many fields. What derails most of us from excellence isn't any lack of innate ability; it's the fact that we give up in response to early failures and/or external discouragement. By applying this understanding to the ways we raise kids and train professionals, we might unleash into society a great deal of otherwise-untapped human potential. Everest! There is no vantage point higher on the subject of expert performance than Anders Ericsson’s lifetime achievement in sharing this book. Through years of deliberate practice in observing what truly sets apart the best from the rest, Ericsson has guided many to new heights of accomplishment through his insights that sparked a paradigm shift of our understanding of “experts”. The ideas shared in these pages will no doubt help propel countless others for decades to come as they make even gr Everest! There is no vantage point higher on the subject of expert performance than Anders Ericsson’s lifetime achievement in sharing this book. Through years of deliberate practice in observing what truly sets apart the best from the rest, Ericsson has guided many to new heights of accomplishment through his insights that sparked a paradigm shift of our understanding of “experts”. The ideas shared in these pages will no doubt help propel countless others for decades to come as they make even greater summits of human achievement. If you are looking to get better at any skill, from athletics, to medicine, to teaching, to science or business, then read this book. The answers are not easy, but they are clear. The world owes Anders Ericsson a deep debt of gratitude for helping shift our collective understanding of expert performance, talent, and extraordinary human results. Malcolm Gladwell most effectively popularized parts of Ericsson’s insights in his book Outliers: The Story of Success. Carol Dweck’s Mindset: The New Psychology of Success is a very complementary and convergent idea. Angela Duckworth’s, Grit: Passion, Perseverance, and the Science of Success magnificently illuminates the insights of persistent deliberate practice. Joshua Foer, met with Anders Ericsson in preparation for his own summit in winning the US Memory Championship and writing his book, Moonwalking with Einstein: The Art and Science of Remembering Everything. Geoff Colvin cemented and extended many of Ericsson’s thoughts in his book, Talent is Overrated: What Really Separates World-Class Performers from Everybody Else. Matthew Syed, became a notable athlete and author of Bounce: Mozart, Federer, Picasso, Beckham, and the Science of Success, with insights owing to Ericsson. In searching for any subject, finding a great teacher is often best performed by looking the world over to see who is most often cited as an authority figure. Powering Google’s search engine is an algorithm that at its core leverages “citation analysis” to find authority figures, also called hilltops; or in this case a towering Peak on the search for expertise. In your quest for a great teacher to help guide your personal journey there is no living author with greater authority than Ericsson. Before I say anything else, this is the single most rewarding book I've read this year. I recommend anyone and everyone to read it. It's one of those books that busts the myths that have been floating around about "natural talent" being something that only a select few possess. Back in 2008 Malcolm Gladwell introduced K. Anders Ericssons research on expertise to the masses. Those who read up on the research understood that there was more to it than the version presented in Gladwell's book. Unfort Before I say anything else, this is the single most rewarding book I've read this year. I recommend anyone and everyone to read it. It's one of those books that busts the myths that have been floating around about "natural talent" being something that only a select few possess. Back in 2008 Malcolm Gladwell introduced K. Anders Ericssons research on expertise to the masses. Those who read up on the research understood that there was more to it than the version presented in Gladwell's book. Unfortunately the press just ran with the "10.000 hour rule" as a headline and failed to delve deeper into what expert performance and deliberate practice really entails. I found the research intriguing and now, after almost 8 years of waiting, it's finally available in a more digestible form. The examples and explanations for how to go about achieving greatness in any pursuit is something everyone can benefit from. Whether you're just starting out with something new or if you've been at it for decades already. What I'm most excited for is the fact that perhaps we can finally get rid of the excuses and false beliefs that have held so many people back from pursuing the things they want. Note to self. Create mental model to remember to figure out how to create mental models. I'm still slogging through the book but it's the same formula over and over and over. The secret to peak performance was revealed in the first chapters, now the author simply insists on telling anecdotal story after story to support the theory. I imagine if you're an athlete or a musician it must be wonderful to read about your peers but for someone interested in other areas, the book peaks in the early chapters and plateaus after. The book answer the question: How do we develop expertise? The premise is: We develop excellence through deliberate practice. Context: This is Anders Ericsson and Robert Pools' mainstream distillation of The Cambridge Handbook of Expertise and Expert Performance, which was made famous through Gladwell's reference of the "10,000 Hour Rule" in Outliers. I am sold on the idea of deliberate practice and did not need to be convinced, however there is plenty here to persuade the reader to adopt the aut The book answer the question: How do we develop expertise? I am sold on the idea of deliberate practice and did not need to be convinced, however there is plenty here to persuade the reader to adopt the author's point of view. What helps you succeed with deliberate practice? A belief you can succeed. The results you experience after getting through a plateau. Minimizing interference, distractions and obstacles. A desire to improve (generally a passion or purpose for developing the skill). Surround yourself with people that will encourage and support you. Create or define stages of improvement so growth can be measured in time. 2. If you do something long enough you will get better. Without deliberate practice, this leads to getting good at being mediocre. 3. All it takes to get better is hard work or effort. If you want to be a better (fill in the blank), just try harder. This final idea, mental models, is tricky in leadership development versus say, playing classical violin or hitting a baseball. This is one of the challenges we face at Stagen Leadership Academy; how do we objectify what is subjective in the experience of world-class leaders? Thesis: there is no such thing as natural ability — anyone can become an expert by putting in the time (10K hour rule). Traits favorable to a task help at the beginning, but don't make a difference at high levels — it all comes down to effort. Mastery is possible through deliberate practice, focused training with an expert who can push you to a higher understanding of the craft. A key ingredient is using mental representations, these help you perform automatically because the actions have become second nature. To excel one only needs to look within. First mention seen in The Economist, April 02, 2016 and I read a hard copy from Pima County Public Library. Peak: Secrets from the New Science of Expertise had good intentions, but ultimately lost me by frequently being too long-winded and digressive. Furthermore, as I was listening to the audiobook, I felt like I was hearing reiteration after reiteration of the same ascertainment. Such a pity, as I expected a lot from this book. I HIGHLY recommend this book to anyone looking to improve on something in their lives. Really interesting information about human potential! Definitely a book I could see myself returning back to when I'm working on something! Well written and easy to follow even with the science-y stuff. I first heard about this book while listening to the Freakonomics podcast a few weeks ago when Anders Ericsson was featured on the podcast and spoke at great lengths about his theory of "deliberate practice." The podcast was very interesting, so I had to get my hands on a copy of the book. After reading glowing reviews, I had high hopes. Unfortunately, the book was subpar, in my opinion. There are moments when I am captivated, but the discussion quickly becomes drawn out, and I find myself waiti I first heard about this book while listening to the Freakonomics podcast a few weeks ago when Anders Ericsson was featured on the podcast and spoke at great lengths about his theory of "deliberate practice." The podcast was very interesting, so I had to get my hands on a copy of the book. After reading glowing reviews, I had high hopes. Unfortunately, the book was subpar, in my opinion. There are moments when I am captivated, but the discussion quickly becomes drawn out, and I find myself waiting for the chapter to end. Don't get me wrong – there's a lot of great material here. Most of all, I'm glad to see someone completely debunk Malcolm Gladwell's "10,000 hour" theory, which I never completely bought. The research behind Tiger mom and outliers and all of those other pop theories on excellence. It's a very liberating and democratic thesis--you are not genetically restrained from being a master of anything. You just need to do deliberate practice. The people at the peak? They are not there due to their "talent". They are there because they have put in hours and hours of purposeful practice into what they do, harnessing the adaptability of the human mind and body. 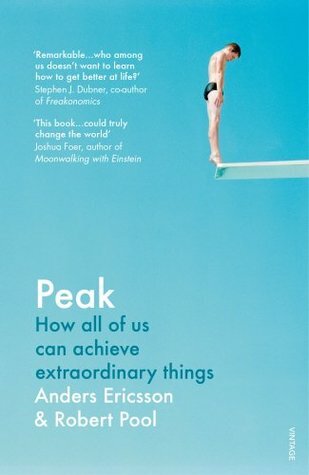 Among a myriad useful, insightful things-- the importance of mental representations in expert performance, naive vs purposeful vs deliberate practice, why skills trump knowledge--the core message of the book is an inspirational one: apart from a few areas (say swimming) you are n The people at the peak? They are not there due to their "talent". They are there because they have put in hours and hours of purposeful practice into what they do, harnessing the adaptability of the human mind and body. Among a myriad useful, insightful things-- the importance of mental representations in expert performance, naive vs purposeful vs deliberate practice, why skills trump knowledge--the core message of the book is an inspirational one: apart from a few areas (say swimming) you are not predisposed genetically to be bad at something, to never be an expert in something, you just need tons of deliberate practice (or just a good amount of purposeful practice if you are not aiming to get to the peak). So some people aren't just "not good at maths". It's only because they might not have a good mental representation at the foundational level and are then led to believe, without any intended malice, that they simply aren't "mathy". (Kind of tangential but Sal Khan's "Let's teach for mastery-not test scores" also relevant somewhat). It's a big change in mindset, a shift from "Wow, she's so talented!" to "Wow, she must have put in a lot of practice", from "I could never do that" to "I can get good at it if I were to put in a good amount of the right kind of practice". It's liberating in a way to think that it would just need a lot of smart kind of hard work. بنظر المؤلف (وهو بروفيسور ولديه ابحاث كثيرة) ، الجينات والموهبة يمكن الحصول عليها من خلال التدريب المتعمد. وبنظره لا يوجد موهوببن بالفطرة في الرسم او الغناء او اي شيء آخر، فالجميع بامكانهم التدرب للوصول الى الاتقان في اي شيء يختارونه!! والكتاب عبارة عن قصص ودراسات تثبت ذلك، مهملا القصص والابحاث التي تنسف كلامه!! Grāmata katram vecākam, katram skolotājam, katram cilvēkam. Precīzi doti vārdi, skaidri definēta doma, iedvesmojoši piemēri. Grāmata par to, kā paņemt atbildību par savu varēšanu jebkurā sevis izvēlētā prasmē un jomā. Grāmata, kuru fiziski nosūtot, esmu ieteikusi tik daudz cilvēkiem, kā vēl nekad līdz šim. Super kitap, beyin ve uzmanlik konulari hep yeni calisilan konular. Yetenek var midir? Dahilik nedir? Nasil calisilmali? Herkes piyanist olabilir mi ve ya fizik profesoru? Cevaplar evet ama yol zor ve uzun. Kitap yolu anlatiyor cok umut verici . Ama turkiye’nin bu egitim duzeni ile mumkun degil ve bu gidisle hic mumkun olmayacak. I found this read completely fascinating. I am interested in the study of expertise and how people become the best (or really, really good) at something. Not because I want to be the best, but because as a teacher, I want to understand how best to encourage students to become their best possible selves. 1. If you are unsure if this book is for you, read the introduction. I found it spellbinding (it deals with the idea of "perfect pitch" and questions whether a I found this read completely fascinating. I am interested in the study of expertise and how people become the best (or really, really good) at something. Not because I want to be the best, but because as a teacher, I want to understand how best to encourage students to become their best possible selves. 1. If you are unsure if this book is for you, read the introduction. I found it spellbinding (it deals with the idea of "perfect pitch" and questions whether anyone is ever born with innate talent or if all talent must be procured). 2. The idea of motivation versus willpower. Perhaps this is semantics, but the underlying idea is that someone who is motivated to learn/become better is going to be successful. Willpower is more of an innate characteristic. Maintaining motivation, according to the book, has two parts: reasons to keep going and reasons to stop. When you quit, it's because you've reached a point where the reasons to stop outweigh the reasons to continue. Those who find a way to power through either find a way to strengthen their reasons to keep going or weaken their reasons to quit. As a teacher, I think this is important, and I hope to find ways/words to encourage students to maintain motivation (not "increase willpower"). 3. The idea of creativity. I've found the question of, "What is creativity?" extremely interesting over the past few years. Typically, we tend to define creativity in terms of artistic expression. But creativity has a broader definition, looking at a person's ability to create something new. The book goes deeper with this line of thought, arguing that "creativity goes hand in hand with the ability to work hard and maintain focus over long stretches of time" (ie: deliberate practice). Creativity, the book explains, "will always remain a mystery...because it generates things that have not yet been experienced." But the underlying thought here is that creative people start earlier, work harder, and stay focused enough to produce lots of results (both bad and good) that eventually lead to the creation of something good. In short: creative people work hard, make stuff, and some of it is good. I would highly recommend this book for parents, educators, management, and anyone interested in knowing how great people become great. We can't all be the top 1%, of course, but being as good as we can at something is a great place to start. If I had to summarize this book in one sentence: A heavy read built around the ideas of deliberate practice and how anyone has the potential to obtain any skill they desire. For those who are trying to find straightforward practical advice to help you obtain a skill. You might find this book a bit frustrating as you have to s If I had to summarize this book in one sentence: A heavy read built around the ideas of deliberate practice and how anyone has the potential to obtain any skill they desire. For those who are trying to find straightforward practical advice to help you obtain a skill. You might find this book a bit frustrating as you have to sift through the chapters to find the information you need. The case studies can drag on and make it feel like a psychology textbook at times. For those who are curious about the topic of human optimization and how experts acquire abilities in their chosen field. You will likely enjoy the read a lot more. You will read several interesting analogies on world class performers and be introduced to many inspiring ideas backed up by detailed scientific research. - Our brain is a powerful tool. It adapts to the demands we place on it. We have tremendous capacity to improve our skills and performance. Through methodical training, we gradually develop new skills and perform tasks that once seemed impossible. - Deliberate practice along with informative feedback and proper mental representation are key factors in helping one become an expert in their field.Through deliberate practice, we have the potential to develop any skill throughout our lifetime. -Many of us misinterpret the famous 10,000 hour rule. We assume that the more hours we accumulate the more we will improve. -Talent is developed, not born! Natural talent or child prodigies don’t really exist! I loved this book because it proves a truth we don't talk enough about: real performance takes practice. Not just any type of practice, but the one that requires conscientious reflection and hard work. 3. Deliberate practice: it's when you can follow a bench I loved this book because it proves a truth we don't talk enough about: real performance takes practice. Not just any type of practice, but the one that requires conscientious reflection and hard work. Key to a good practice are the mental representations you form - how you visualize the end result. And, of course, the ability to deconstruct and improve every tiny detail until you match that representation. The better you are able to see it, the better you are at knowing what to do to get there. Engagement is also important - when practicing you need to really focus on what you are doing, to analyse and improve, otherwise you can just slip into naive practice. And although body's and brain's natural ability to adapt in the face of challenges outweighs any genetic differences (that may, in the beginning, give some people an advantage), there's no rule of how much it will take you to reach a certain level. The 10.000h rule is not a rule, it's just a bad, catchy, interpretation of a study's results. This book is kind of a reality check for Malcolm Gladwell's Outlier. Gladwell's 10,000-hour rule sounded like an impossible thing to do, for you to become an expert in a topic because of the sheer number of hours you have to put in. This book gives you techniques, mental models to develop skills and improve in any particular area. The biggest takeaway for me is the deliberate practice as a lens to deconstruct any expert or superstar in a topic and understand them better. - Continual practices do not necessarily lead to improvment. So the rule of Malcomn Gladwell about 10,000 hours practice will make you an expert is not so correct. To be an expert, you need to follow the correct practice and the correct practice is either Purposeful Practice or the best is Deliberate Practice. -	Continual practices do not necessarily lead to improvment. So the rule of Malcomn Gladwell about 10,000 hours practice will make you an expert is not so correct. To be an expert, you need to follow the correct practice and the correct practice is either Purposeful Practice or the best is Deliberate Practice. o The first is our old friend, the belief that one’s abilities are limited by one’s genetically prescribed characteristics. o	The second myth holds that if you do something for long enough, you’re bound to get better at it. o	The third myth states that all it takes to improve is effort. -	There is (almost) no such thing as Innate Talent. Expert performers develop their extraordinary abilities through years and years of dedicated practice, improving step by step in a long, laborious process. There are no shortcuts. Various sorts of practice can be effective, but the most effective of all is deliberate practice. Deliberate practice takes advantage of the natural adaptability of the human brain and body to create new abilities. Most of these abilities are created with the help of detailed mental representations, which allow us to analyze and respond to situations much more effectively than we could otherwise. -	Knowledge is just Potential Power. The bottom line is what you are able to do, not what you know, although it is understood that you need to know certain things in order to be able to do your job. o Body: push it hard enough and for long enough, and it will respond by changing in ways that make that push easier to do. You will have gotten a little stronger, built a little more endurance, developed a little more coordination. But there is a catch: once the compensatory changes have occurred— new muscle fibers have grown and become more efficient, new capillaries have grown, and so on— the body can handle the physical activity that had previously stressed it. It is comfortable again. The changes stop. So to keep the changes happening, you have to keep upping the ante: run farther, run faster, run uphill. But if you push too far outside your comfort zone, you risk injuring yourself and actually setting yourself back. o	Brain: How does the brain change according to training given that mostly the neurons do not grow: in most parts of the brain the changes that occur in response to a mental challenge— such as the contrast training used to improve people’s vision— won’t include the development of new neurons. Instead, the brain rewires those networks in various ways— by strengthening or weakening the various connections between neurons and also by adding new connections or getting rid of old ones. -	Deliberate practice develops skills that other people have already figured out how to do and for which effective training techniques have been established. The practice regimen should be designed and overseen by a teacher or coach who is familiar with the abilities of expert performers and with how those abilities can best be developed. -	Deliberate practice takes place outside one’s comfort zone and requires a student to constantly try things that are just beyond his or her current abilities. Thus it demands near-maximal effort, which is generally not enjoyable. -	Deliberate practice involves well-defined, specific goals and often involves improving some aspect of the target performance; it is not aimed at some vague overall improvement. Once an overall goal has been set, a teacher or coach will develop a plan for making a series of small changes that will add up to the desired larger change. Improving some aspect of the target performance allows a performer to see that his or her performances have been improved by the training. -	Deliberate practice is deliberate, that is, it requires a person’s full attention and conscious actions. It isn’t enough to simply follow a teacher’s or coach’s directions. The student must concentrate on the specific goal for his or her practice activity so that adjustments can be made to control practice. -	Deliberate practice involves feedback and modification of efforts in response to that feedback. Early in the training process much of the feedback will come from the teacher or coach, who will monitor progress, point out problems, and offer ways to address those problems. With time and experience students must learn to monitor themselves, spot mistakes, and adjust accordingly. Such self-monitoring requires effective mental representations. -	Deliberate practice both produces and depends on effective mental representations. Improving performance goes hand in hand with improving mental representations; as one’s performance improves, the representations become more detailed and effective, in turn making it possible to improve even more. Mental representations make it possible to monitor how one is doing, both in practice and in actual performance. They show the right way to do something and allow one to notice when doing something wrong and to correct it.